Home » Uncategorized » WHY SOME PEOPLE HAVE MORE CAPACITY TO LEARN ENGLISH? WHY SOME PEOPLE HAVE MORE CAPACITY TO LEARN ENGLISH? When you are learning a language you always notice that some people learn faster than others. There are people who spent most of their lives learning English and cannot have a fluent conversation whereas other people who just spent one year learning they speak almost as a native person. Many times I have asked to myself, why? Well, I tried to find and answer to my question, and that is what I’m going to develop in this post. As I have explained before, I was really interested in know why this happen and what can have influence in our learning because as many of you I am learning English and trying to improve myself, so I thought If I know more about what can affect in learning a language maybe I can find the way to learn faster and better. What I found is that there have been a lot of researches to guess if the ability to learn a language is developed with the time or people born with it. Some researches show that the most important aspect is the attitude you have when you think about learning English, if you think learning a language is easy, then it will be. So students, the first thing you should do is start thinking positive! It is believed that the most important skills you should have when you are learning a language are: determination, motivation and practice. – Easiness to differentiate sounds: this ability let them to associate different sounds with symbols, so they can save this information in their memory. – Capacity to translate the words in their head almost in an instant. – Ability to think in this language: people who have this ability can even dream in the language they are learning! Furthermore, It has been demonstrated that learning a language alter the grey material of our brain, and when you have learned a language when you were a child, in the present you have more grey material and more ability to learn a third language. On the other hand, some researches show that personal factors have influence in the process of learning a second language such us: self-esteem, inhibition, anxiety and motivation. It is really important that the person who is learning a new language believes in himself and that he is going to be successful. 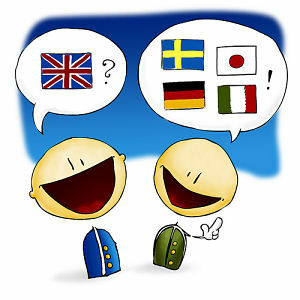 In addition, to process a language is necessary to risk sometimes, to speak with others without fear. People who are outgoing try to find more opportunities to speak and practice, being brave and taking the initiative are really important skills for you to have a faster improvement of your English. Anxiety is other factor that has influence in learning a language; it is related with fear, doubts, and worries. Believe me, when you are worried about what and how you are going to say what you are thinking you do it worse than when you feel relaxed. For example, while you are having a conversation with your friends your English is much better than when you hare having a job interview because you are under pressure and your level of anxiety increases sharply! Finally, motivation is directly related with success. For example, you are more motivated to learn English when you really have the necessity to communicate in this language. People who don’t need English in their day to day maybe are less motivated to learn and that’s why it takes longer than if you really need it for your job, your school, to communicate with your friends, etc. Once I had researched all the aspects that make you have a better comprehension about why some people have the ability to learn English faster, I really recommend you to look into yourself and see what can you improve or change in your life, not only to learn English but for your personal life too. So after have researched what makes some people learn faster, I realized that it’s all in your mind! You have to desire it, imagine in your mind that you speak English fluently and go for your goal! Be relaxed, take your time and lose your fear. However students, learning English also required hard study but don’t worry we can help you with this! By worldchoiceeducation in Uncategorized on August 16, 2013 .